The Walking Dead presents a tricky concept all around, to endlessly follow a narrative arc that early zombie fiction historically kept short-form. Any fan of the Robert Kirkman comic has run aground of this idea as well, watching as the rotating cast of characters reinvent their surroundings year after year, while the TV series has mostly followed suit. As with many comic adaptations, the AMC rendition scales back a bit of the theatricality, and you could feel the first eight episodes of Season 6 somewhat shuffling around that precipice, playing with time and format. In particular, experimentation and sharper group focus over the first eight breathed major new life (even amid more frustrating turns) into the usual hack-and-slash, and however unresolved, the choice to leave 2015’s “Start to Finish” on such an immediate cliffhanger was at least an interesting one. Judging by the February 14 return however, The Walking Dead shambles straight over that cliff into a refreshing new era, bringing the heightened characterizations and stylistic flair we’ve always wanted of the series. Without hesitation, “No Way Out” is the best, most transformative Walking Dead hour in the show’s six-year legacy. As I mentioned of the 2015 premiere, it’s tough to discuss the virtue of a solitary hour without leaning on spoilers, but rest assured that no character or conflict goes unaddressed, nor does “No Way Out” lack for shocking turns both original, and comic-borne. Near every lingering question of the past eight episodes gets their due, simultaneously pivoting the series into a very, very different future. Few punches are pulled, and casualties hit way harder than expected, even amid those who’ve had it coming for months. We pick back up exactly where the 2015 finale (or rather its post-credits) scene left off, between Daryl, Sasha and Abraham facing down a crowd of nefarious strangers, who themselves bring a sinister confidence to threatening the uninitiated. I won’t spoil the unexpected (but perfect) resolution, and things aren’t looking much more optimistic in Alexandria either. Rick and co. continue their zombie march around town, any human voice threatening their anonymity, while the captive townspeople look on in horror. Balancing the spotlight equally across Alexandria (including those who were sadly omitted from the finale) also goes a long way toward redeeming certain characters yet to click with audiences; an overall coming together for the series that often feels so scattershot in its “us vs. them” mentality. It’s a unity of action that puts to bed many gripes the Alexandria arc has invited, also clearing the slate for a newer, gleefully sinister threat. We got a taste of that heightened energy by the 2016 prologue, but “No Way Out” still leaves plenty more questions to answer, and worlds to explore, very much the beginning of a whole new story. 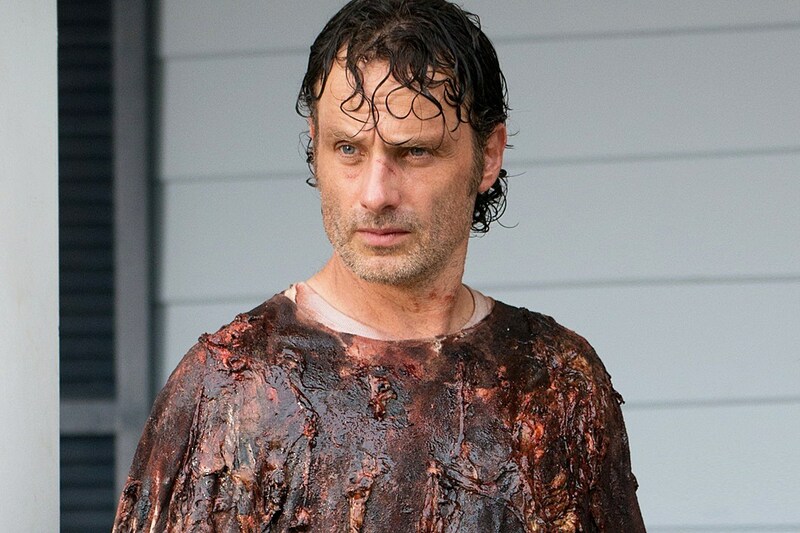 Andrew Lincoln himself previewed that the latter half of the episode would see a “radical shift” for the characters, a vague enough statement at face value, but no less accurate for adjusting the six-season trudge through survival. There’s a larger world out there, and “No Way Out” finally gets the chance to move on from yearly scenery changes, and start fighting back. Zombies will always threaten the unprepared. They may also finally prove a manageable threat, one Rick actually seems suited to lead against in a way Sunday’s premiere can display visually. Too often characters simply tell us of Rick’s greatness, while in context the man comes off like a gruff lunatic. Who doesn’t appear to understand how human perspiration works. You’ll still find hints of that old world, including the same survival platitudes that grant characters an excuse to gab for a few minutes, but offer little of substance to the series’ philosophy at large. Practical issues abound, to wonder whether certain strategies against the dead should be standard practice rather than a one-time set piece, and at least a few cliffhangers from 2015 will resolve neatly enough to wonder why they were necessary in the first place. Still, “No Way Out” is absolutely The Walking Dead at a peak its fans have always dreamed, both stylistically (the latter half brings some colorful flair and camerawork that will drop jaws living and dead alike) and narratively, an incredible kickoff to the back half. Not one character feels underused, and just like its comic counterpart, Sunday’s premiere marks a terrific entry in to larger world, large enough to feel The Walking Dead has only just begun. I can’t say which, but one moment had me laughing and cheering harder than any other instance I’ve ever watched the show. Conspiracy theorists looking for death foreshadowings and secret betrayals will get their money’s worth. Apparently, threatening Glenn within an inch of his life never gets old for the writers. 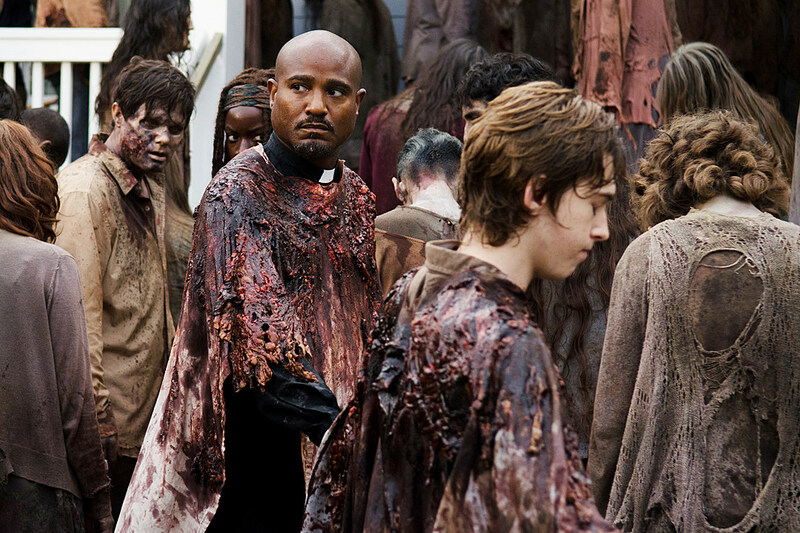 I cannot speak enough toward Greg Nicotero’s direction here, that the series should always feel so visually distinct. Consider at least one fan theory floating around the premiere debunked! The Walking Dead will premiere the second half of Season 6 on February 14 with “No Way Out”, airing at 9:00 P.M. on AMC.